encompass has been highly commended in the RegTech category for AI & Machine Learning in the inaugural Regulation Asia Awards for Excellence 2018 at a ceremony in Singapore on 13 November 2018. Historically, the processes for gathering anti-money laundering (AML) and Know Your Customer (KYC) data have been largely manual, making them costly, time-consuming and unreliable, with resulting records still reflecting outdated or incomplete information. As criminal threats continue to drive increasingly stringent regulation, financial institutions have been electing to terminate business relationships to reduce their exposure to regulatory risk. 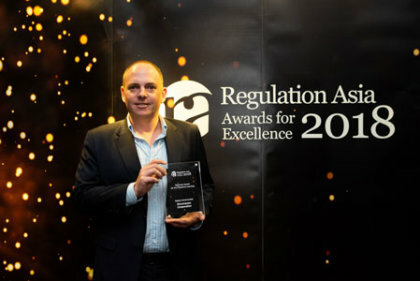 For a full list of award winners, visit regulationasia.com/awards. Regulation Asia is the leading source for actionable regulatory intelligence for Asia Pacific markets. Since 2013, their audience and subscription base have grown to include regulatory bodies, exchanges, banks, asset managers and service providers, allowing them to play a key role in the regulatory agenda. Visit regulationasia.com or connect via LinkedIn or Twitter.